Some areas are seeing above-freezing temperatures while sea ice disappears. Warm January temperatures are lasting into February in some Arctic locations. 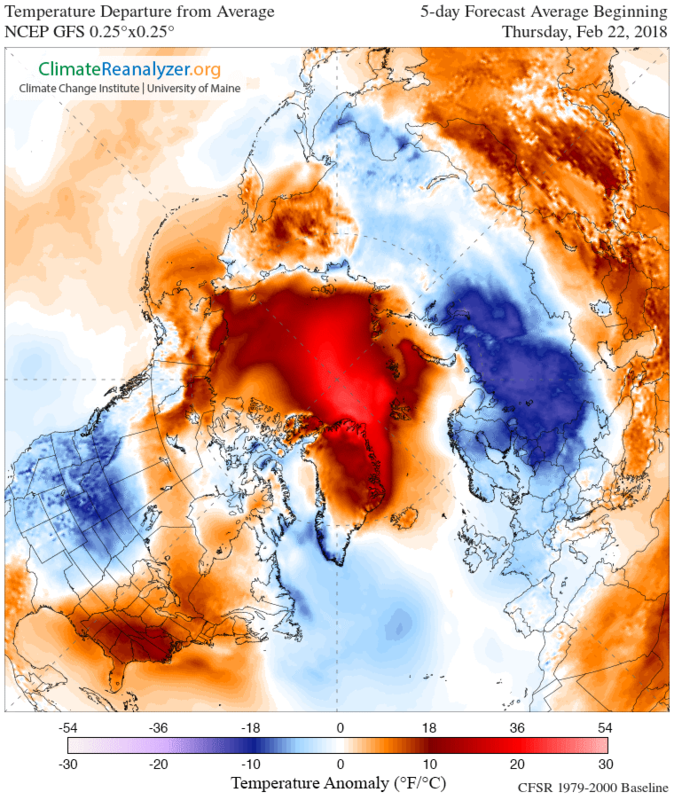 On Monday and Tuesday, Cape Morris Jesup in Greenland recorded temperatures above freezing —and well above normal February temperatures for the station, reports the Washington Post. According to the Danish Meteorological Service, the station saw the thermometer rise more than 39 degrees on Sunday night, temperatures that stuck around for two more days. As the northernmost weather station in the world, Cape Morris Jesup has seen no sunlight since October, a fact that makes this weather event even more striking. These warming events aren’t confined to Greenland. In Alaska, Utqiagvik saw a high of 31 degrees and Deadhorse a high of 33 degrees on Tuesday. Data from the Danish Meteorological Institute shows that average Arctic daily mean temperatures in January and February have been well above historical averages. According to Earther, these warmer temperatures are the result of a blip in the jet stream, which is letting cold Arctic air escape and warm air find its way into the region. While warming events like this happened in the past, they are becoming more frequent as the Arctic continues to warm faster than anywhere on Earth. Higher temperatures are also leading to record sea ice lows in the Arctic — in January, the region saw the smallest amount of sea ice in recorded history for the month. As InsideClimateNews reports, sea ice in the Bering Sea is actually shrinking at a time it should still be growing. During eight days in mid-February, the Bering Sea off Alaska’s west coast saw nearly a third of its sea ice disappear. The lack of ice is wreaking havoc on some Alaska Native whale hunting seasons.